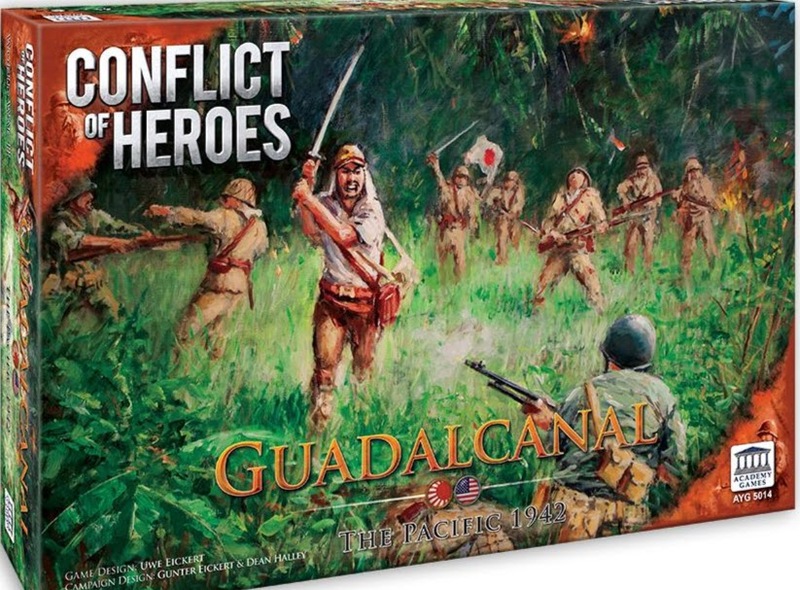 Conflict of Heroes: Guadalcanal was released in 2016 and is a squad-level, tactical, hex and counter wargame. The Pacific Theatre of WWII holds a massive interest for me; despite my living a figurative stones throw away from a lot of European WWII history. I am just in awe of the willing and persistent sacrifice of both sides' combatants in a theatre that arguably comprises the most bloody battles of WWII, Guadalcanal included. To say I was eager to review this game would be an understatement. CoH:Guadalcanal focuses on the landings of the US Marines onto the strategically important island of Guadalcanal and their subsequent defence of the island and the vital airfield it offered to the Americans. This action was at an early part of the Pacific War and is the first major allied offensive against the Japanese who had been enjoying a string of victories as they successfully invaded large chunks of real-estate in the South Pacific. I think it is useful for wargamers to understand the context in which any wargame is set and Academy Games have done a fantastic job setting-the-scene with a rule-book littered with designers notes and a three-page [campaign introduction] that describe the strategic situation in which the players cardboard chits find themselves. The game contains 12 firefights that play out the Marines defence of Guadalcanal against increasing numbers of Japanese forces. The rule-book follows a programmed instruction method whereby players can read a scant 9-and-a-bit-pages of rules before playing the first fire-fight (I estimate that includes about 3 pages of examples and designers notes). If you are an experienced wargamer, there are lots of similarities to other rule sets that will enable you to be up and playing very quickly, for example the Line of Sight and blind hex rules were very familiar and the overall terrain defensive modifiers are almost exactly the same as in other tactical-level wargames. These similarities are all wrapped in a combat system and turn structure that is completely unique, as far as I can tell, to the Conflict of Heroes line. The rules are also very well written and littered with a plethora of gameplay examples, it was a rare case where I had to look up a rule in which either it wasn’t immediately obvious from reading the rule or there wasn’t a relevant example to clarify the situation. Many good wargames reduce the IGOUGO problem by allowing an opponent to Op Fire a moving stack or react to a move. CoH completely removes the IGOUGO problem by alternating turns between players after every action is resolved. The players only have 1 active unit at a time and 7 action points to spend on that unit. The different actions cost a different number of action points and when they are all spent, or if a player decides to activate another unit, that counter is flipped to its 'spent' side. I really like this mechanism, it not only indicates which units have already moved (my memory is very grateful) but it removes any down time as you're only waiting for your opponent to make one action e.g. a single unit moves one hex, before it rolls back to you. It also means that as a player you're constantly having to evaluate whether your plans remains sensible in light of your opponents last move or whether you should adapt and activate a different unit, potentially losing Action Points. All combat actions are quickly resolved by 2d6 modified by unit attributes and the environment. The combat system is very intuitive, easy to teach and if you're reading the rules by yourself, to learn. In essence you add the firing units Attack Rating to 2d6 for your Attack Total. The Defender adds any defensive modifiers from terrain to their Defence Rating. If the attack value is greater than or equal to the defence value that unit is hit. When a unit is hit another counter is placed face-down underneath which will affect the units attributes and available actions. Two hits on the same unit eliminates that unit. That's essentially it, although the action cards do add a nice layer of immersion. The combat system is really quick and I didn't feel that it was missing any crunch that we wargamers often yearn for. Attacking units use one of two Attack Ratings printed on the counter dependent on whether their target is a vehicle or personnel target. Defending units use one of two Defence Ratings printed on the counter depending on which direction the attack is coming from. In my experience the direction individual units are facing is rarely modelled in wargames. Here, it is seamlessly integrated into the combat and adds a level of tactical consideration that I enjoyed e.g. should I activate this unit to turn and face the encroaching enemy and receive the best defence possible thereby losing my opportunity to attack with this other unit? In overall terms of complexity this game is a little lighter (and maybe more fun?) than GMT's Combat Commander series, which does suffer a little with the IGOUGO problem. To stretch a bad analogy, if Advanced Squad Leader is like completing and filing your own tax return (some masochists enjoy it), Combat Commander would be like planning a monthly budget and realising that you've actually got money left over (always nice to see), CoH:Guadalcanal is like getting lucky after taking a punt at the betting shop (Let’s try that again…). In my face to face plays of this I felt like I was having more fun for a very similar level of enjoyment when compared to Combat Commander series. If I did score games this game would get top marks for fun and also for the amount of [historical backgrounds] provided for each firefight. 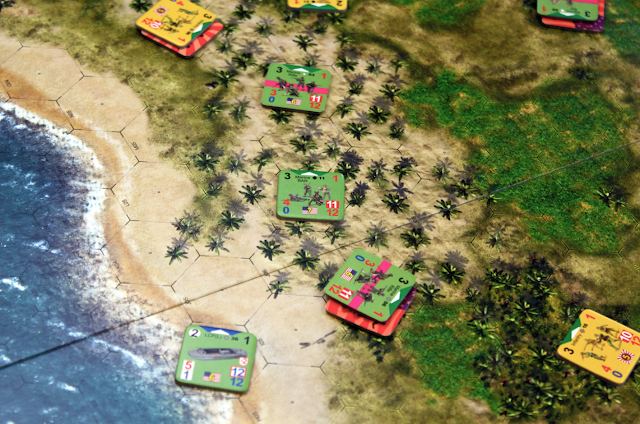 Academy Games have a reputation of releasing fun, educational games and in that they've excelled themselves with CoH:Guadalcanal. One of my biggest dislike of many wargames, and I still play them so it's not that big, is that in a lot of them the players have a perfect knowledge i.e. the players can see all terrain and unit attributes and plan accordingly, there is no fog of war. This is not necessarily a bad thing in a wargame as long as the scenario is balanced, you're then playing against your opponents tactics and trying to mitigate the randomness of the dice. However, there is an extra level of immersion when you're fighting with fog of war modelled. CoH does a good job of this as your opponents do not know what effects their hits are having on your units and players can attempt hidden movement, or even setup hidden, in cover terrain. This is a very important tactic of the Japanese player and when it works it is, depending on your perspective, either a beautiful moment of bravery or an excruciating loss. Unfortunately, you're not provided with anyway to mark hidden movements but the rule-book recommends to print out maps from the Academy Games website to record hidden units on. You can also download all of the firefights and rule-books for the entire CoH system and expansions which I think is a good sign for the level of support that this game continues to receive. There are very clear differences between WWII-era military forces of America and Japan, their moral, funding, equipment, ethos etc. feel different in reality and should feel different when playing them in a game. In this game, and many others, I am always pleased to see those differences being part of the game system. Apart from the usual elements of Attack Rating and morale or Defensive Rating being different depending on the unit and nationality you also get a pool of hit counters specific to each nationality. I should highlight that in each firefight the Japanese player has to add from 1 to 5 'No Hit' counters into their mix. This is a great boon to the Japanese player effectively giving their unit an occasional additional hit, or more, before it is destroyed. This is a subtle yet very effective way of modelling the apparent bravery/personal disregard of the Japanese troops under a 'banzai charge' for example. However, the biggest change to the CoH system is the addition of Bushido Points for the Japanese player. This allows the Japanese player to achieve firefight-specific objectives to get Bushido Points which give them more Command Action Points (CAPs) per round. CAPs are distinct from Unit Action Points and allow players to interrupt their ‘activation’ and use other fresh units to immediately react to their opponents actions. This is a necessary escape from the on-rails Unit Action Point system and it gives players a real feeling of making important and timely tactical decisions. The Japanese player should always have an eye on those point-awarding objectives. The Command Action Points also permit easy balancing of the game when pitting players of vastly different experience of the game against each other, which I found really useful when introducing the game to newcomers and it is not often considered in wargames. The counters, which break the wargame mould of 1/2" and 5/8" counters, are a glorious 1" of real-estate to pick up and stack, as with all CoH games. On a purely physical accessibility measure this wargame beats any other that I have seen. I can see wargamers with poor eyesight being able to play this when other wargames are no longer legible. Additionally, Academy Games have provided a hard plastic organiser in which to store all the counters. This is hands-down the best stock insert I have ever seen in a wargame; other wargame publishers should take note. There is more than enough room in it for all the counters from the base game and the expansion to be, not just stored, but even organised into nationality, unit type and even system counters by type as well. I can't tell you how much I appreciate that, after the outlay in time and money of storing other wargames' counters. The maps, of which you get 4, are satisfyingly geomorphic and depict the terrain in a photo-realistic style, the trees even have shadows! Initially, I didn't like the artwork on the maps, thinking that it was just getting in the way and too busy, but these criticisms largely evaporated through game play. The only minor gripe with the components that did remain is that the hex sides and hex numbers sometimes were too dark to immediately discern them against heavy jungle hexes but this was not a significant hindrance. The expansion adds 5 firefights and several more units with which to play with. The first firefight of the expansion - The Last Banzai, The Fight for Henderson Field: The Second Night, picks up where the 11th firefight of the base game finished, i.e. at the end of the first night during the Fight for Henderson Field. This is a really nice touch and provides players with sense of continuity between the base game and the expansion. These two scenarios are however 4 player, behemoths and I couldn't arrange a 4 player game to cover the two firefights so we played two-player and still had a blast. In an ideal world I would have liked the expansions firefights and units to have been included in the base game as they feel like an integral part of the base game. The game is excellent without the expansion but the expansion’s firefights have to be printed from the Academy Games website. The OCD collector in me would have liked them to be in the same book or at least a book of the same paper and print quality as the base game’s firefight book. You only get a single page of paper introducing the new units and rules for mine along with a single punch-board of tokens which costs $25, this feels a little steep. Prior to each round starting, which is made of any number of player turns, the players roll 2d6 for initiative which determines who is going first. This can be altered be spending Command Action Points but this mechanism felt a little arbitrary and I recall one player looking a bit annoyed that they had lost the roll six times in a row. C’est la Vie! I really enjoyed this game, and not just for its theme. The combat system is simple yet it captures everything that I would want and it exposes the nuance in different fighting attributes of both forces whilst remaining balanced. It could almost be classed as introductory wargame but even a veteran wargamer would find a lot to enjoy in this system. There are no game-slowing table look ups and your actions and decisions come around so quickly, sometimes it’s a relief when the Round ends and you can take a short breather; I want all my wargames to have this quality. I will still evangelise for Combat Commander, but now I may be inclined to offer this up as a more fun experience, i.e. less downtime, fewer rule look-ups and plays quicker than other tactical squad-level games. I would like to thank Academy Games for the review copy of this game. You can currently get the Guadalcanal and US Army Expansion bundle from the Academy Games website for a sale price of $80.